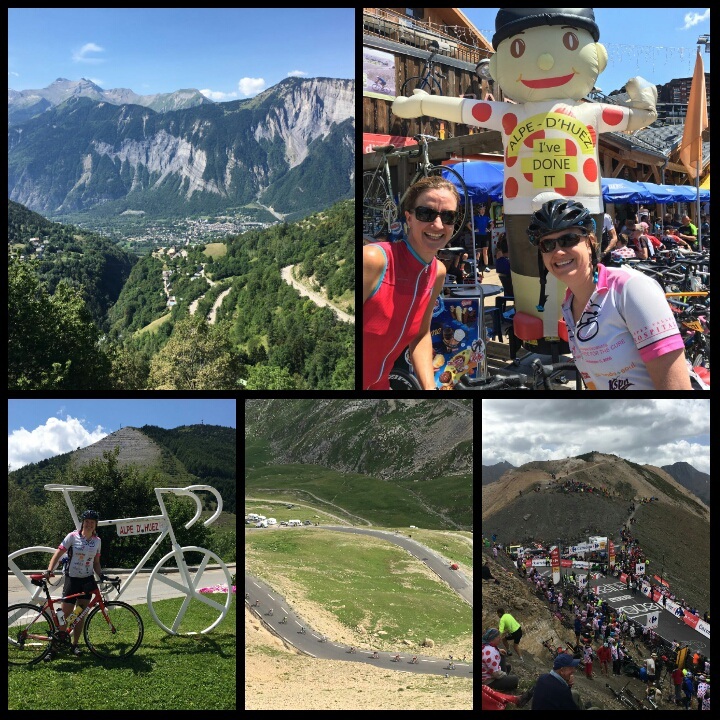 After a wonderful week of exploring the French Apls by bike and climbing parts of iconic mountain stages on the Tour de France, Laurie and her good friend Jeanie drove back to Italy to greet Andy in Milan. We all shared a room in a descent hotel with a surprisingly delicious breakfast buffet. “I wouldn’t be surprised if that woman made all of this herself” Jeanie remarked as we stood over the array of cakes, muffins and other sweet treats. We also had artisinal breads and cheeses, deli meats, hard boiled eggs and yogurt with many topping options to choose from. After breakfast, we left our excess luggage at the hotel and headed for the train station. Along the way we pulled into a large parking lot, where Laurie tried her hand at driving a stick shift Fiat Cinquecento (500). She regrets never learning when she had the opportunity in her teenage years and was super excited to spend a few minutes learning on a rental car. Outside the train station we said our goodbyes to Jeanie and set off for our train to Verbier, Switzerland. 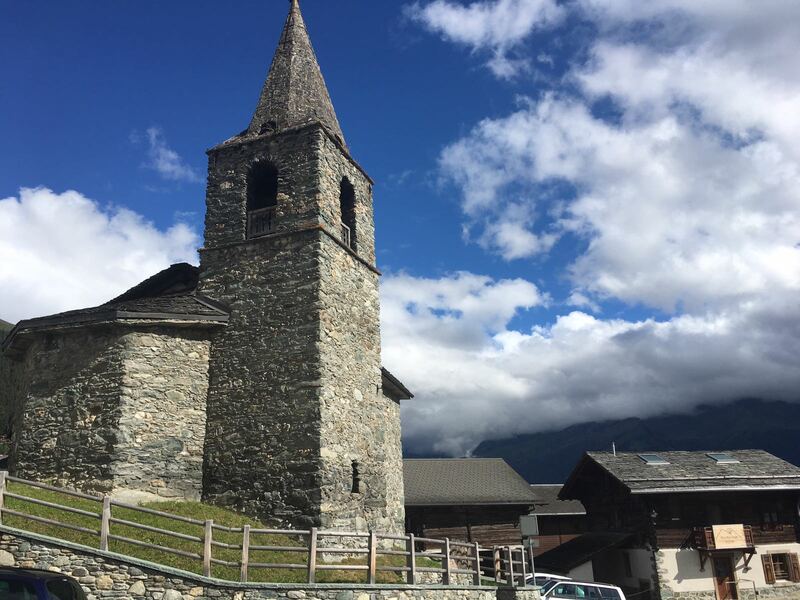 The full Haute Route traverses from Chamonix to Zermatt, but because we have limited time on our vacation we chose to start from Verbier to get the most out of our adventure. We listened to the announcements in Italian, French and English (although neither of us speak the first two languages) which listed our stop – Sion – as what we thought was the 3rd one. 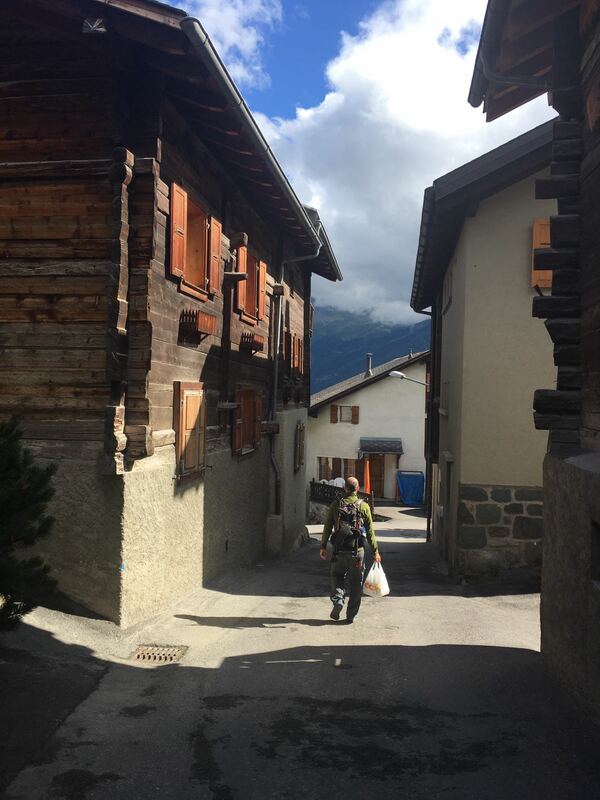 As we pulled into what we thought was Sion, we shouldered our packs and disembarked. We walked down to find a board with connecting train information to determine our next platform. We couldn’t find any train going to Martigny- our next transfer point. But there were a few heading to Sion…weird. We ran back to our train and re-boarded just before the doors closed. We were relieved but also felt embarrassed and couldn’t help but laugh at our mistake. The mountain bikers we met earlier (and to whom we had said goodbye to moments earlier) looked at us surprised. “One more stop” we explained as we continued to laugh at ourselves. 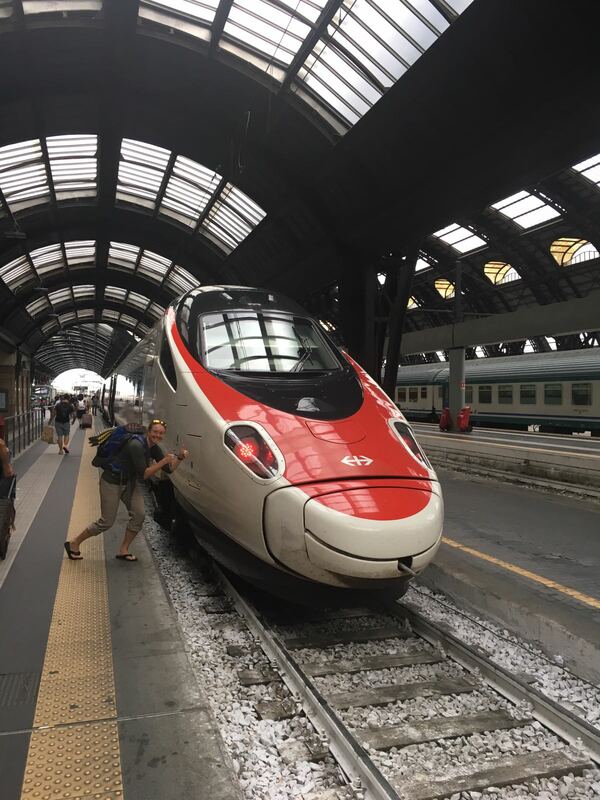 Lesson learned – look at the station sign before getting off! We rode for another 10 minutes through valleys with vineyards oriented in different directions, offering great texture to the hilsides. We correctly disembarked in Sion and transfered to another train that would take us to Martigny. 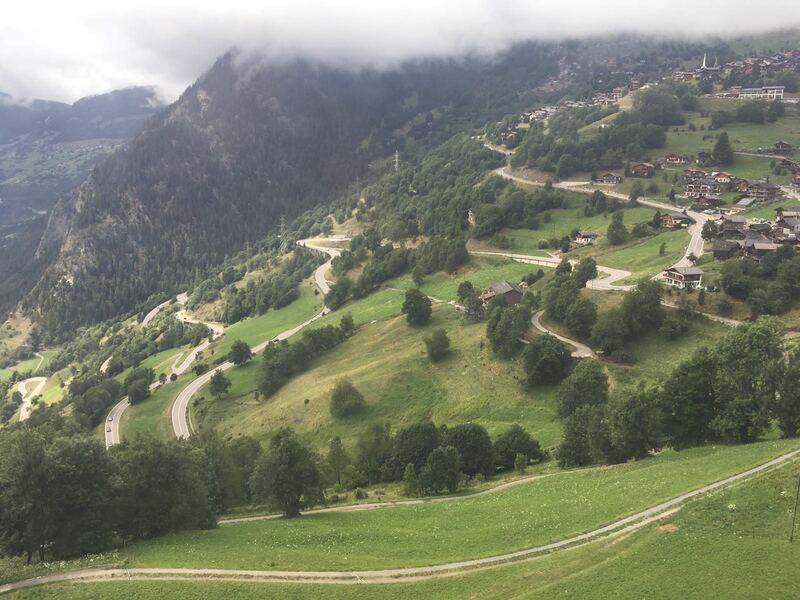 From there we took another train to Le Chable, followed by the gondola to Verbier. In Verbier it was cloudy and cold. Then it started spitting rain. And just as we put our rain jackets on, the clouds parted and we started roasting. 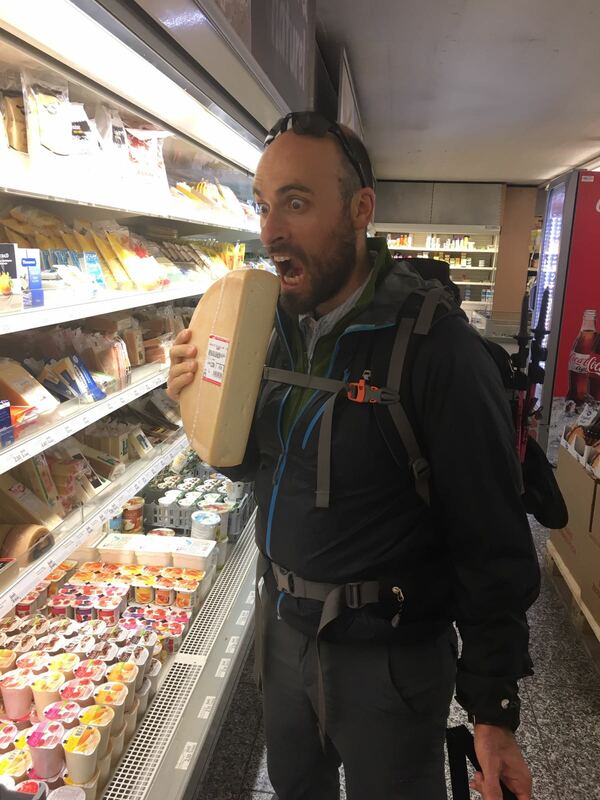 We quickly made a plan, found a bank, withdrew Swiss francs and went to the Coop where we bought dinner. After checking into Hotel Les Touristes – a simple, low key hotel with very nice and hospitable staff, we went to our room and gorged on roast chicken, pesto, salad greens, corn crackers and brie. We stood in a corner of the room, over a small table and ate like hungry stray dogs. “I haven’t had greens in over a week” Laurie exclaimed with her mouth full of chicken meat wrapped in fresh, delicious salad greens and pesto. We managed to make a bit of a mess but clean up wasn’t terrible. After dinner we relaxed a little. But this is when the nerves showed up. Laurie was anxious and felt we had done a poor job of packing because she left her pack cover at the hotel in Milan. We had also chosen to forgo our down jackets since we never hike in them. And because we will be staying in huts, we didn’t anticipate needing them. Andy reassured Laurie that everything would be ok. That we have mountain knowledge, are both good decision makers and no matter the conditions we would make the right calls. Laurie was starting to relax. Since the wifi connection wasn’t very strong in our room we went downstairs to the dining area and created maps on Gaia GPS for all our hiking days. This really helped Laurie because now we had a plan for each day. When looking at maps, the multitude of routes makes it overwhelming. 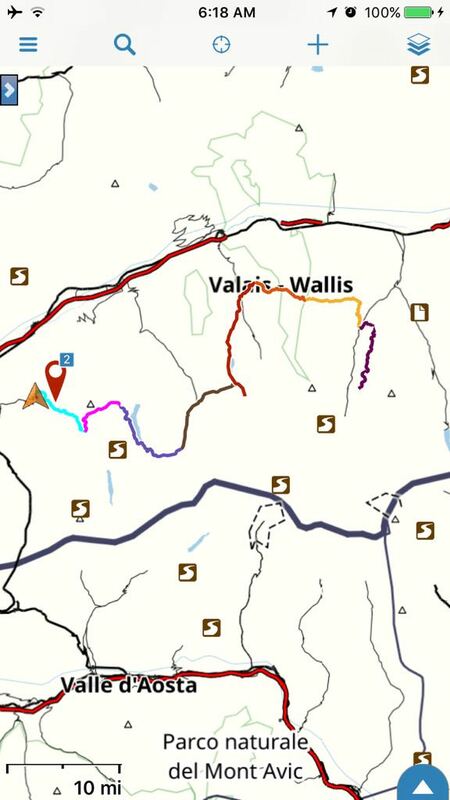 The Swiss Topo maps look like a mess, so we were glad we got this done. The staff told us of a free concert in town (classical music) but it started at 11pm. At 10:15 Andy took a ‘nap’ which lead to a deep sleep. Given his 2 days of travel with minimal sleep he is doing quiet well. Laurie wanted to get the most out of our town day but we chose rest instead. Tonight we are grateful for wonderful friends and punctual Swiss trains. Please keep us advised as to how crowded the trail is along your way. This looks so beautiful and such a fun way to hike! Will do Scott. In our next few posts (day 6 onwards) we will be sure to mention this, but for now I will say that the trail hasn’t been that crowded at all. Certainly the JMT is A LOT more crowded. And from what we hear from other trekkers, the Tour de Mont Blac is a lot more crowded that this trail. I’m so glad you guys are back at it! I was thinking the other day how I missed reading your blog last summer. I tried finding other PCT blogs to follow this year but it just isn’t the same. I’m happy to read of your new adventure as I feed my newborn at 3am :p wishing you safe travels! So glad you are still enjoying our adventure tales. Congrats on the little one. What is his/her name?? 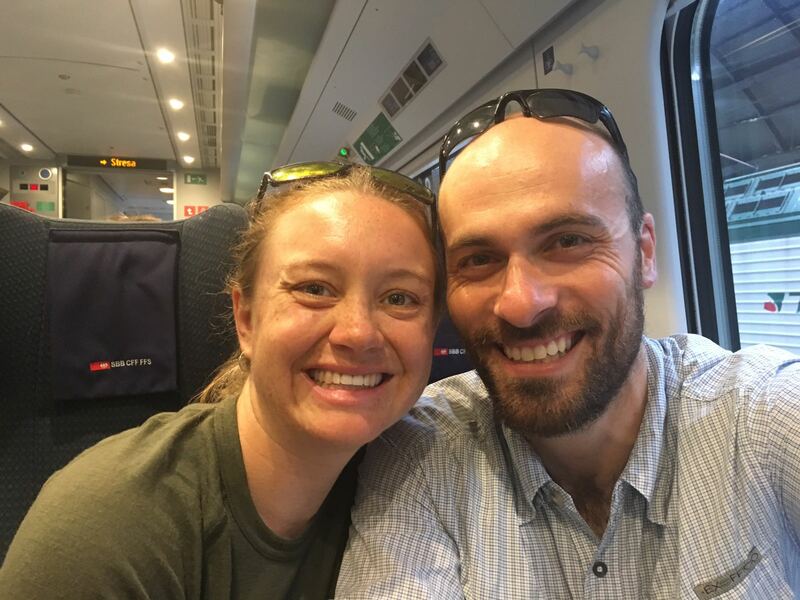 I followed your PCT hike as my husband and I are planning to hike the PCT so I was looking for couples to follow and glean some tips and tricks from. I loved your writing and experience so much that I have continued to follow and love when you posted afterwards as well. I am so excited you are back! The landscape is beautiful, I can’t wait to hear all about the hike. How fun to experience a different style of hiking. Take care, have fun and safe travels!